Last time we did a general update was when we crossed over to Newfoundland, deciding to forgo the northern route through Labrador to save time. The weather was getting colder and we could not chance being stuck in minus temperatures. It was cold but beautiful. This was our third time back to “The Rock” and I just couldnt get enough. Last time I, Luke, did it on my own by motorcycle in a bit of a rush. This time I could explore it in more detail with the family. The kids learn about Vikings, geology and more as we had field trip after field trip. As the night time temperatures dropped it was time to leave the island. We took on the Cabot trail on Cape Breton and then made our way to Halifax for a visit with Cynthia’s grandmother. Staying in Canada as long as possible was the name of the game now. As long as the weather did not dip below zero, and our water supply in the trailer did not freeze, we needed to stay in Canada so that we can maximize our allowed time in the states for the winter months. We were able to hold out in Nova Scotia, P.E.I. and New Brunswick till about the end of October. The kids learner about the Titanic, tides, Canada’s brith and Anne Of Green Gables. We did a study on mushrooms, as it was the season, and making ice cream and cheese. We crossed into America from lower New Brunswick and did Halloween in Maine. Staying at Walmart’s along the way so far, we discovered Cabelas Outdoor stores. They let you stay overnight for free and dump as well. We made our way from one to the other as we crossed New England. One of the big things I wanted to do on the eastern coast was climb Mt. Washington in New Hampshire. As we approached the mountain in early November, snow had covered the top with a 4 foot layer and winds were high. A small window of 2 days of warm weather opened up while we were there and I was able to make the summit on November 2nd. Winds were high on the top but no precipitation, which is just what I was hoping for. It wasn’t easy but I was happy for the chance. With the climb over we couldn’t take any more chances being this far north as the forecast showed minus temperatures overnight. We made a dash south, through Massachusetts, Connecticut, New York and Pennsylvania. We quickly went through, having sampled the attractions and sights our last time through in 2014, to get to warmer weather. Gettysburg was our end stop. Gettysburg is very special to us, having visited twice before, we always felt at peace here, ironically. The untouched battlefields and historic town spoke to us. We stayed at the Gettysburg Lodge both times, which has individual cottages on a hilltop overlooking the battlefields. This time also, instead of staying at a Walmart or campsite, we decided to stay here again and get some respite from the road. We booked 7 days to recoup and enjoy the town. It was a welcome break and since we were not spending anything on staying at campsites so far, we decided this would be a well worth expenditure. The plan after Gettysburg is Washington, D.C. for a couple days and then onto Virginia. 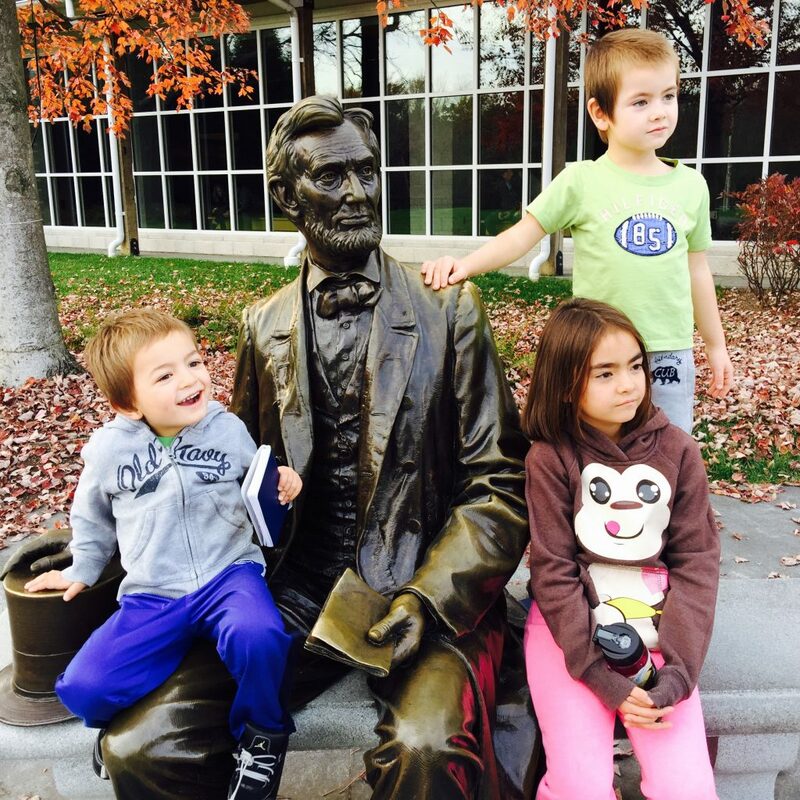 The kids at the Gettysburg National Park.